The Sawsmith (or Saw Smith) Radial Arm Saw was an amazing tool from the 1950’s and 60’s that was developed by the folks who created the Shopsmith line of Woodworking tools. The purpose of this blog is to build a database on information on the Sawsmith, and to connect buyers and sellers of Sawsmith's and their accessories. So, How Does This Blog Work? This blog (short for Web Log) is dedicated to the Sawsmith radial arm saw which was manufactured by the companies Magna and Yuba Consolidated; the early manufacturers of the Shopsmith tools. This blog features links to Sawsmith saws and Shopsmith accessories that fit the Sawsmith which are for sale on eBay and elsewhere on the web. As a side line we will also list the occasional Sawsmith 2000 tablesaws which come up for sale from time to time. While they have little in common with the original Sawsmith, they are still part of Shopsmith history, and if found at the right price, are an OK tool. Be sure to save us as a favorite and check back often as the web (and therefore this blog) is constantly changing. Also, check the neat and FREE service offered by WatchThatPage.com below. This ad from 1961 hows the Add-A-Tool bracket that allows the Sawsmith to power the entire range of Shopsmith SPT's (Single Purpose Tools) like the Bandsaw, Jointer and Belt Sander. Very light activity, so save us in your favorites and check back often. Click the pic to "Biggie-Size" the ad. 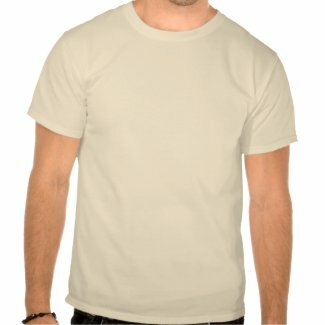 It's taken way longer than expected, but we finally got the SawSmith US Patent tee shirt posted on Zazzle. Please note that you not only get to select the shirt size and color, but you have a wide range of styles and qualities to choose from. Click the pic and check it out. What's with that funny plug on the end of the SawSmith power cord? I just received an email from someone who found this blog and who was just given a SawSmith Radial Arm Saw. One thing stumped him, and now that I've answered his question I realize that it would make for a great blog post. So without further adieu, here's his question and my answer. Feel free to improve upon it in the comment section. A few months ago I helped a friend move several hundred miles away. In return for my help, she offered me any tool from a pretty large selection. One/third of this 3-car garage was full of her ex's power tools. His health is failing rapidly and will never use them again. I spied this SawSmith and couldn't take my eyes off it. Cool!! I can add this tool to my woodworking hobby tool inventory. How can I tell which it is actually wired for? Also, I was searching thru your blogs concerning owner's manuals. I don't see how to acquire one. I checked the plate on the tool frame and found it's a model 703000. I have no idea what that indicates. I see you're talking about Mark I to Mark V machines. How can I tell what it is? I can also clearly read the serial number if that helps. Not knowing if it's a Mark I or Mark V or anything in between, I would have no way of knowing what manual I'd need. I'm sure that model number tells it all. I'm about ready to get it up and running but need to replace the power cord. I believe I'd use a 14/3 wire for it. But, then again, I may need 12/3. I don't yet know which to use. I'll need to more closely examine the existing cord. I'm really looking forward to using this awesome machine. Having read that you are a former employee of the company that made this tool, I figured you were the best person to contact for information about it. Any help you can give would be greatly appreciated. Your friend who said that the plug "indicates that it must be plugged in to a 115/120 receptacle with a 15 amp or higher service" is the winner! 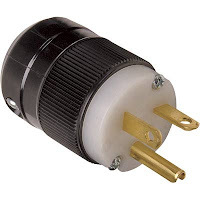 Ideally tools with large motors like this should be plugged into a dedicated receptacle; meaning no other electrical device is on the same circuit. Whenever you see this type of receptacle installed you can be assured that it is 110v and is connected to at least a 15 amp breaker or fuse. You can get an owners manual from Shopsmith by calling their customer service department at 1(800)762-7555. Say "Hi" to Linda from me. You'll also find a lot of information and comradery at the SawSmith Yahoo group located at this link: http://groups.yahoo.com/group/sawsmith/ There's not much going on during the Summer on this group, but things pick-up as the weather cools off a bit and everyone starts heading into their shops. Once you join you'll have access to a bunch of files, including some things called "service bulletins" which were distributed to SawSmith dealers back in the 50's and 60's. There's a wealth of information there, and you'll want to start there if you saw fails to start once you get it wired. One last thing. Visit www.patentplaceusa.com and search "SawSmith", and get yourself a copy of the patent for the Sawsmith. It's fascinating and reveals a number of secrets that aren't clear in the manual. Good luck and I'll see you in the forum. This book occasionally becomes available on eBay, so unless you are desperate for a copy you might want to wait for one to go to auction, otherwise get ready to spend upwards to $100 on Amazon. Here's a link to Fun With A Saw on eBay. At the time this article the Sawsmith Radial Arm Saw was sitting on the launch pad just waiting to change the DIY world. R.J. DeCristofo was by this time a famous woodworking author, famous for his Power Tool Woodworking For Everyone book. 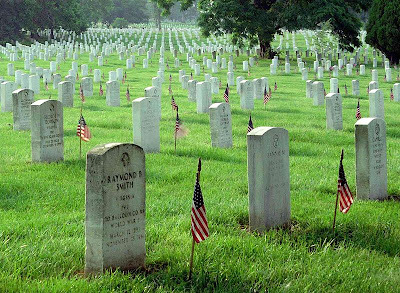 This article is in four parts, which are linked below, or you can simply go to our home page and scroll through them. Click the pic to "Biggie-Size" the page. Arguably the Sawsmith's most unique feature is the variable speed dial, which allows it to perform a large number of tasks at their proper speed. Up until this point several companies had sanding discs for the RAS's, but they ran at full saw speed, so they were mostly good for sending up smoke signals. Click the pic to "Biggie-Size" the page. I don't know what happened to this article because it suddenly peters-out. Oh well, it was good while it lasted. Click the pic to "Biggie-Size" the ad. Apparently Magna American had too many Mark V's and Sawsmith RAS's back in 1962, so they had a contest to give some away. I sure hope they looked better than the artist's rendering. In 1962 Magna American Corp. ran this uplifting ad promoting the Shopsmith Mark V and the Sawsmith Radial Arm Saw. Magna was located in Evendale, Ohio just north of Cincinnati, and as the address on the ad mentions they were located just off I-75. Today Shopsmith Inc. is located just 50 miles north of Evendale in Dayton. The Best Powertool Ad EVER! 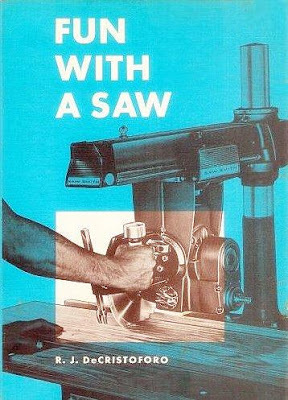 I LOVE this ad, and it was for a SAWSMITH Radial Arm Saw! Click on the pic to Biggie-Size this Magna America Sawsmith ad from 1965. Well, this was just about the end for Magna American. The Shopsmith Mark VII was the first complete tool designed without the help of Dr/ Hans Goldschmidt, and it showed. Some of the ideas were good, but the execution was not. Plastic parts were made without knowledge of plastic, so many of them melted in use, or cracked in unheated garage shops. This misstep derailed the company and ultimately they never recovered. Years later when John Folkerth purchased the Shopsmith tool line it was with the hope that the Sawsmith could be resurrected, but by that time safety requirements would have required expensive redesigns, and ridiculously punitive court judgments against power tool manufacturers discouraged Shopsmith Inc. from bringing the Sawsmith back from the grave. We feel the need to mention the Shopsmith Sawsmith 2000 tablesaw. This saw is details on our Shopsmith blog shopsmith-tool-hunter.blogspot.com so we won't go into too many details here. Ckick the pic to "Biggie-Size" this is an ad that ran in 1991. Serial numbers referenced on http://www.shopsmith.com/ownersite/faq/radialarmsaw.htm indicate the first Sawsmith radial arm saw was introduced in December 1957 by Magna Engineering of Menlo Park California. (Some references mention “Magna Power Tool Corp.”). Magna Engineering was founded by a partnership of Hans Goldschmidt, the inventor of the first Shopsmith multi-purpose tool the 10ER, and brothers Frank and Robert Chambers. Yuba was a HUGE conglomerate that started during the San Francisco gold rush in the 1800’s. After operating successfully all those years, in 1957 Yuba's directors were warned that by the late 1960s the company's long-profitable gold fields would peter out. Hoping to diversify the company (then called Yuba Consolidated Gold Fields), started buying-up companies like a rich drunken sailor. Yuba was already manufacturing a line of garden tillers and was looking for a line of items that could fill the slow winter months. Woodworking was more of a winter activity, so the Shopsmith line looked like the perfect match. Early in 1958 Magna Engineering merged with Yuba Consolidated Industries. Goldschmidt headed Yuba's engineering efforts until 1960, then left to operate his own toy and game design company. Things went very bad for Yuba. According to a March 1962 Time Magazine article titled “How Not To Grow“, the wild spending on poorly managed companies left Yuba bankrupt. By 1961 a group of former employees of Yuba formed the company Magna American, and these folks went on to produce the Sawsmith, Mark VII and several garden tools including tillers until they too ran into trouble. By 1965 the last Sawsmith left the Magna plant, and the tools went into storage. In 1972 John Folkerth, a stock broker in Dayton, Ohio, purchased a Sawsmith from a widow friend of his mother, and when he went on a search for a replacement blade for it he instead found the tooling that Magna had in storage. John spent some time raising funds and purchased the tooling for the entire Shopsmith and Sawsmith line and moved it to Dayton, Ohio. The rest of the story that I’ve never seen in print is despite such statements in old Shopsmith Inc. literature that “Shopsmith still owns the tooling for the Sawsmith and that they could one day revive the tool“; the truth is it was determined years ago that the Sawsmith would be too difficult to sell in our lawsuit-happy country, so the tooling was sold for scrap. 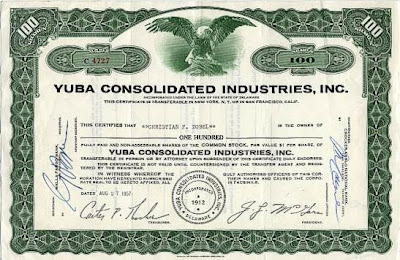 Five years ago, San Francisco's Yuba Consolidated Industries was a sturdy little company which by concentrating on its traditional business—gold mining—managed to turn a tidy $1,700,000 profit on sales of $22 million. By last year Yuba had mushroomed into a glamorously diversified corporation that could point to sales of $98 million drawn from enterprises ranging from missile-base construction to the manufacture of power tools. But, in dramatic contrast to W.R. Grace & Co. (see above), Yuba is a case study in how not to expand a corporation. Last week, having lost $12 million last year despite its skyrocketing sales, Yuba was in bankruptcy court. In 1957 Yuba's directors were warned that by the late 1960s the company's long-profitable gold fields would peter out. Hoping to diversify the company (then called Yuba Consolidated Gold Fields), the directors brought in as chairman and president a hustling and autocratic executive named John L. McGara. McGara, 51, who had made his name by merging a complex of plate steel and boiler equipment suppliers into Buffalo's Adsco Industries, abolished Yuba's monthly board meeting to give himself freer rein. He ruthlessly dismissed old Yuba hands who questioned his policies. The directors didn't mind, because McGara promised that with his kind of leadership Yuba would do "in two or three years what it took other companies ten or 20 years to do." Up in the Suite. Seven months after his arrival at Yuba, McGara merged the company with San Francisco's Portuguese-American Tin Co. Then, in return for lavish amounts of Yuba cash or stock, he successively bought a welding company, a steel fabricating mill, a Texas petrochemical firm, an Indiana crane manufacturer, an Ohio power toolmaker, and even his former employer, Adsco Industries. Within three heady years, Yuba boasted 17 operating divisions run from a plush suite of offices in San Francisco's new Crown Zellerbach Building. Carried away by McGara's predictions that Yuba's sales would soon hit $330 million a year, investors ran the company's stock from $3 a share up to $17.50 a share. In its haste to expand, Yuba bought companies that were struggling under inefficient management—and rarely overhauled them sufficiently to make them effective. The insistence that, above all, Yuba must show continual sales gains drove division managers to enter into many contracts that later turned out to be profitless; one division lost $3,300,000 on two Titan II missile-site construction jobs. No less disastrous was the practice of pushing divisions into businesses that they did not understand. The Nichols-Southern division, which had been clearing as much as $250,000 a year renting equipment to the chemical and petroleum industries, stumbled into a loss of $250,000 when it sought to expand into highway construction. Down in Court. By March of last year, McGara had run through $22 million in Yuba cash; the company's reserves were nonexistent, and its debts had mounted to a grotesque 83% of its net worth—2½ times what is usually considered sound for a company of its type. In desperation, the directors agreed to pay McGara $30,000 a year for ten years to break his contract, replaced him as president with J. (for John) Philip Murphy, 53, former head of one of the McGara-bought subsidiaries. Hoping to convert Yuba into a more modest but profitable $35 million-a-year operation, Murphy sold off six divisions. But of the eleven remaining divisions, only four were in the black, and at last Murphy decided that bankruptcy was the only way out for Yuba. Ironically, as Murphy last week awaited a federal court ruling on Yuba's bankruptcy petition, one of his most vocal creditors was ex-President McGara—who was miffed because Yuba was in arrears on his $30,000 annual payment. Complained McGara, who had apparently been rethinking his philosophy of management: "What is happening now is entirely inexcusable. The company should be reduced to a mining operation only. Then creditors could be paid off in two years." That's right kids, this is a scan of genuine Yuba Consolidates Industries Inc stock. Click the pic to Biggie-Size it, then print this out on your finest paper. At that point you will be holding something that is exactly the same value as this stock certificate! Oh well, at least they got the Sawsmith right.